A bargain-priced winner - it makes you wonder why this sort of thing isn't built into DAWs as standard. Price. Great for levelling vocals. Sidechain monitor button would be good. 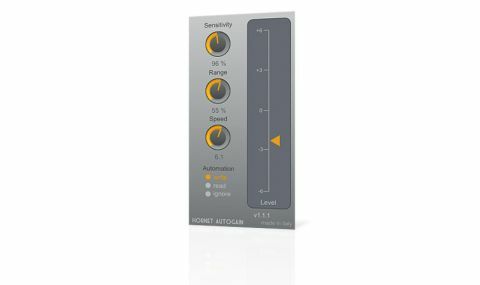 HoRNet's auto-leveling plugin takes a reference signal via its sidechain input and uses the volume envelope to control the output of its main input signal. "You can adjust the Sensitivity of the plugin to changes in the sidechain signal"
The main signal is adjusted to keep up with the sidechain, with visual feedback via the orange arrow, although it's not a 1:1 correlation - there is some algorithmic magic going on in the background, presumably involving RMS rather than peak level monitoring. Not much user input is required. You can adjust the Sensitivity of the plugin to changes in the sidechain signal (raising it if the reference isn't dynamic enough, for example), the relative amount by which the main signal changes along with the sidechain (Range), and the Speed of the response. With Automation Write enabled, gain changes are written into the host DAW as automation data. AutoGain's main purpose is leveling vocals and lead lines, which it does nicely. A sidechain monitor button might be useful, but this is a bargain-priced winner - it makes you wonder why this sort of thing isn't built into DAWs as standard.